One of the rewards of tutoring people in English is learning a lot about foreign cultures. For instance, many Asian languages do not have past or future tenses which must be a relief after trying to figure out the meaning of the future perfect which denotes an action that has been completed cast into the future. In other words, it’s a fait accompli that hasn’t happened yet, an hubristic absurdity. The Asians tell the tense by the context, “I go home yesterday,” not by a change in the verb. But the best reward is learning about food. One of the most useful for the American taste is the root vegetable, daikon which is a mild, slightly sweet radish. The word itself is Japanese and means “large root.” A significant vegetable in Asian cuisine, it actually originated in the Mediterranean basin about 500 B.C. and was brought to China by traders. Happily, it can be grown easily in the high country. My friend, Tam Nyuyen, tells me that the most useful variety is the white daikon, called the icicle. Shaped much as a carrot, it is white, and as with the carrot, it needs deep soil, preferably a raised bed of loose, friable soil free of rocks. The rocks can cause misshapen roots. Also, it is low in calories while being nutritionally rich. Daikon can be baked, boiled, or steamed and is particularly good slowly roasted with mixed vegetables, such as butternut squash, carrots, red onions, small red potatoes, cherry tomatoes, artichoke bottoms, zucchini, and what have you. Set the oven at 400º, toss the vegetables with olive oil and salt and pepper to taste, place in a 25 x 30 inch roasting pan, and put in the preheated oven for 25-30 minutes. Remove from the oven, drizzle with balsamic vinegar, and roast another five minutes. Also, it’s delightful in a carrot and daikon salad in which both the carrots and the diakon are peeled in strips and served with an Asian dressing and perhaps some pine nuts. Requiring a deep, loose, fertile soul, daikon seeds should be planted about an inch deep and two inches apart. Once they have sprouted, they should be thinned to six inches apart. They should be watered regularly, keeping the soil damp but not soggy. Their fertilizer should be low in nitrogen, as in a 5-10-10 ratio. They generally mature in about sixty days which allows for successive plantings in the high country; however, they can be pulled before they mature. 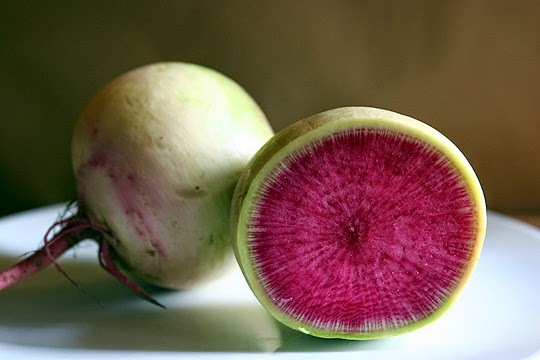 Our next underground vegetable is another radish, the watermelon radish which is a Chinese heirloom. However, this radish is not long and thin, but plump and round about two to three inches in diameter. It is better when pulled before its full maturity, lest it become pulpy. When sliced, this radish appears as if were a small watermelon with a white outer ring and interior striations of magenta and pink. As with daikon, it can be fried, baked, broiled, and boiled and can be eaten cooked or raw. They do particularly well in salads, offering as slightly peppery, minty taste as well as lavish color, perking up some bland appearing lettuce. If sliced, they should be sliced thin. They’re a charming accent when added to a daikon and carrot salad. 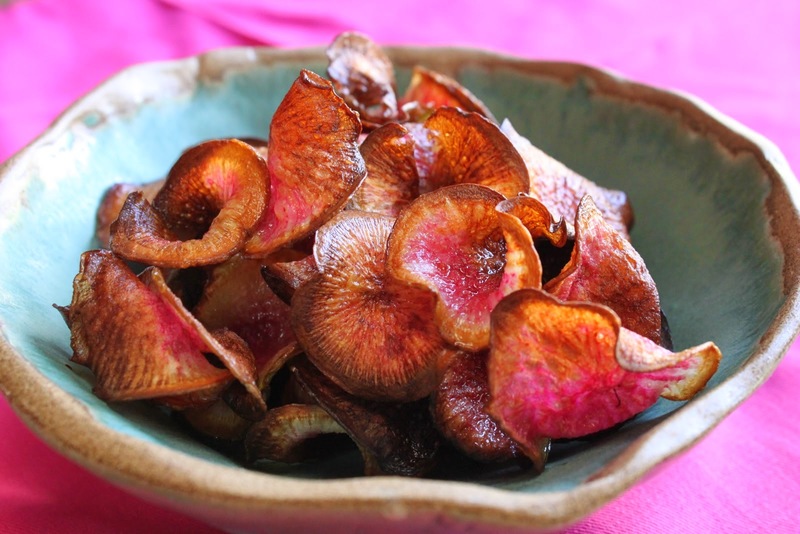 An interesting recipe that would appeal to people who savor French fries, potato chips, corn chips, and other fried crunchies is baked watermelon radish chips. It has the appeal of color which most chips and fries lack and also a bright taste, other than salt, to wake up the palate. Wash two or three watermelon radishes and then slice them to uniform thinness. Preheat the oven to 325º. Place the sliced radishes in a bowl with olive oil, salt and pepper, thyme, dried basil. Mix thoroughly and place them evenly on a baking sheet. If fancy, use a parchment sheet. Bake ten to fifteen minutes, turn over, and bake another ten to fifteen minutes. If they’re sliced thick, it may take 25 minutes, but thin is better. They go well with baked salmon. Bon appétit avec des radis chinois. Dana Prom Smith and Freddi Steele edit Gardening Etcetera for the Arizona Daily Sun in which this article appeared May 31, 2014. Smith emails at stpauls@npgcable.com and blogs at http://highcountrygardener.blogspot.com.